From: Dr. Sherry Tenpenny outlines the many disorders from iodine deficiency IAOMT 2007. 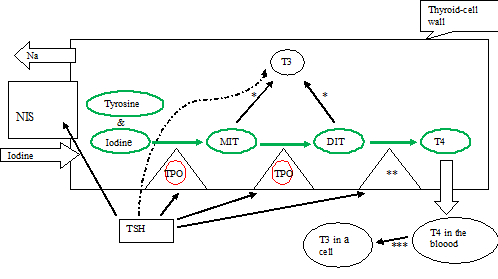 Figure below with more detailed explanation: Thyroid hormone production schema. Here is a transcript of her lecture. She obtained the information from the book “The Thyroid and its Diseases”. Iodine enters the thyroid cell via the NIS (sodium (Na) iodine symporter). The NIS is a pump that pumps iodine into the cell, while expelling sodium. This system needs hydrogen peroxide. The main production line is marked by green cirkels and arrows. Tyrosine and iodine together form MIT (monoiodotyrosine). MIT = 1 tyrosine + 1 iodine. One MIT makes one T1 (monoiodothyronine ). MIT and iodine together form DIT (diiodotyrosine). DIT = 1 tyrosine + 2 iodine. One DIT makes one T2 (diiodothyronine). One MIT with one DIT form one T3 (triiodothyronine). Two DITs form one T4 (thyroxine). The coupling of an iodine atom to either tyrosine or MIT as well as the coupling of MITs and DITs is performed by TPO (thyroid peroxidase). The chemical process that leads to either MIT or DIT releases hydrogen peroxide ( = H2O2) which is used by the NIS. In the schema, the hydrogen peroxide is indicated by a red circle. Surplus hydrogen peroxide is mopped up by glutathione peroxidase (GPx), of which selenium is an important part. T1, T2, T3 and T4 are released into the blood vessels so it can be used by the rest body. T4 is converted elsewhere to T3 as needed. This conversion requires selenium. T1 and MIT both contain one iodine atom, T2 and DIT both contain two, T3 contains three and T4 contains four. The thyroid releases mostly T4, less T3 and even less T1 and T2 into the rest of the body. The body uses the TSH to either increase or decrease the flow of iodine into cells. When iodine is sufficient and T4 production is running along smoothly, TSH needs only be very very low: the current flow is satisfactory. But as is explained below (at “Problem: Really, really low iodine“), low TSH can also be an iodine sparing strategy, shifting from T4 production to T3 production. In this case iodine is deficient and T4 production is practically non existend! If selenium is also deficient though, there might even be high levels of unconverted remaining T4 present. However this does not mean that T4 is being produced! Using TSH levels to diagnose for hypothyroidism or hyperthyroidism is like looking through a very dirty looking glass: you cannot really tell what’s going on. Even measuring T3, T4 (or even FT3 and FT4) will not provide a complete picture. What you need to know is whether or not T4 production is up to par. It mops up excess hydrogen peroxide: Selenium (as a part of glutathione peroxidase (GPx)) is used to get rid of excess hydrogen peroxide in the thyroid cell. If selenium is low, some hydrogen peroxide will remain in the thyroid cell causing damage (oxidative stress). Hydrogen peroxide is the stuff that you can use to bleach your hair. It will do the same thing to your thyroid. Cells with too much damage will die. When too many cells die, thyroid hormone production will be impeded. Thyroid hormone is vital to life. You can not go one day without it. So the body goes through hoops to keep production going at the expense of other processes in the body. Cells in the body convert T4 to T3 as needed. Selenium is needed for this conversion. The thyroid makes mainly T4. T4 is a storage hormone. The body can tolerate relatively large fluctuations in T4 production and levels without you being aware of this. This way, if the thyroid gets sick temporarily (because of a bad flu for instance), your body can still get enough T3 and you’d be none the wiser. Having a store of T4 floating around makes the system really stable. The store of T4 can be low or high, as long as there is enough to make enough T3, you as a person feel well and healthy. Only when stores get really low or really high do you start to feel off. T3 on the other hand is regulated within a much tighter range. Low T3 makes you feel hypothyroid, cold and slow. High T3 makes you feel jittery with a rapid heart beat. Problem: Low iodine makes it harder for the body to make thyroid hormone. The thyroid will try to get more iodine. The thyroid has top priority on iodine in the body. The NIS will try to get more iodine inside the cells. The body stimulates the NIS via the TSH. So TSH rises in order to get more iodine into the cell. When selenium is deficient, this will lead to damage and Hashimoto’s. Problem: Really low iodine combined with selenium sufficiency will result in an enlargement of the thyroid, called goiter. The thyroid increases its surface in order to catch as much iodine as it can. The TSH also raises further to stimulate the NIS. When selenium is deficient, goiter is much rarer. The thyroid gets damaged on low selenium and this might be a reason why the thyroid isn’t able to enlarge. But it might also be a “decision” of the body to protect against further thyroid damage. Problem: Really, really low iodine will trigger the body to lower the TSH. This results in favouring T3 production over T4 production (regardless of the amount of selenium you have, because this is a crisis situation). It is the low TSH that stimulates this switch from mainly T4 to mainly T3 production. The math behind this is simple: T3 takes one less iodine atom than T4 does, so in an way it’s cheaper. This way, a little iodine goes a long way. The problem is this: the thyroid can’t predict how much T3 is needed in total by the entire body at any given moment. And it isn’t allowed to produce too little, because that’s life threatening. So the thyroid will always overproduce T3. This will give you hyperthyroid symptoms. Sufficient selenium. Low TSH, high T3, low T4 is typical of this situation. Because you’re hyper, a lot of doctors now conclude that you have too much thyroid hormone. In part, this is true: you have too much T3. But you’re lacking in T4! You need iodine to resolve this, so that T4 production can resume. Insufficient selenium. Low TSH, high T3, high T4 is typical of this situation. On too low selenium, the conversion from T4 to T3 doesn’t take place. So you’re left with ample T4 stores, yet you can’t use them. It is important to understand that the high levels of T4 are not a result of high T4 production. They are simply there because you’re not converting them to T3. You need selenium + iodine to resolve this. This is important: whithin this context low TSH means your body is giving up on finding any more iodine and because of that switches from T4 production to T3 production, an iodine saving strategy. Even though you are hyperthyroid, this situation is caused by a deficiency, not an excess! Problem: Really, really, really low iodine will impede even the production of sufficient T3. This now becomes a life or death situation. T4 is either low or high, depending on selenium status. T3 is now getting lower and lower. You’re becoming hypothyroid. This is important: you can be hypothyroid on sufficient levels of T4 and low levels of T3 if selenium is lacking! Adding selenium at this stage will temporarily lift the hypothyroidism by converting the remaining T4 to T3. Of course, after that, hypothyroidism returns, because of the lack of iodine which blocks the production of new T4. Often, you will switch back and forth between these last two stages (hyper and hypo), because of varying iodine and/or selenium levels depending on your diet that day. Hypothyroid and hyperthyroid symptoms take turns. This is very confusing. To you as a patient, but also to a doctor. You need iodine and selenium to resolve this. The selenium in glutathione peroxidase (GPx) will start to mop up excess hydrogen peroxide within the thyroid cells, thereby guarding them against damage. The thyroid can then start to repair itself. If too much damage has been done, this might not be completely possible. The conversion of T4 to T3 will start up again. This will enlarge the amount of T3 available to the body and will add greatly to your well being. Suppose you have been badly iodine deficient as well selenium deficient for a long period of time. If selenium deficiency was there first, you might be left with an unusable T4 store. Adding selenium will convert this to T3. Your hypothyroid symptoms will go away. But as soon as the T4 store gets too low, you will again become hypothyroid. The solution is to take selenium as well as iodine. In order to stop the damage from happening, the body tries to lower production, see “TPO and TPO antibodies” below. Because the high iodine will keep T3 and T4 production going, hydrogen peroxide is being produced. Because of the low selenium, there is not enough glutathione peroxidase (GPx) to get rid of this safely. The result is that the thyroid becomes damaged. So if you want to start taking iodine, start taking selenium first. 200 mcg for a month should do it. Only then start taking iodine. Giving iodine to a selenium deficient thyroid is like throwing gasoline on a fire: you get a lot of damage in the thyroid. On low selenium and sufficient iodine, T4 production can take place, but will damage the thyroid. When TPO couples an iodine atom with either tyrosine or MIT, hydrogen peroxide is produced. Lowering TPO will help prevent this. That is exactly what the body tries to do by creating TPO antibodies. The TPO antibodies attack TPO and by doing so prevent hydrogen peroxide from being produced. Unfortunately, also T4 producton is diminished because of this. You will become hypothyroid. Measuring TPO antibodies is used by some doctors to diagnose Hashimoto’s, the condition where the body attacks its own thyroid gland. In regular medicine there is no cure for Hashimoto’s. Taking selenium however, allows for glutathione peroxidase (GPx) production which will mop up any excess hydrogen peroxide. This in turn will make TPO antibodies absolete and they will go away. As you can read above, hyperthyroidism is the situation where the thyroid resorts to producing T3 in stead of T4 because it lacks iodine. It is a deficiency that causes hyperthyroidism, not an excess! Methimazole (also known as Tapazole or Thiamazole or MMI or Strumazol) is an antithyroid drug. It blocks TPO, thereby blocking the production of T3 as well as T4. This does stop your hyperthyroidism, but at the same time fixes nothing in the long term. This drug will make you hypothyroid. When you stop taking it, you become hyperthyroid again. Sometimes, depending on the diet of the patient (the iodine content of the diet that is), the hyperthyroidism resolves by itself. What doctors do when you are hyperthyroid is this: kill the thyroid and replace with synthetic hormones. What they should be doing is fix the thyroid by giving it what it needs. Does selenium make you more hypothyroid? When you’re hypothyroid, you’re low in iodine (because that’s the reason why you’re hypothyroid). If you’re also low in selenium, the body will not try to find more iodine so hard, because that will only damage the thyroid. So TSH does rise, but not as much as it would with sufficient selenium. Also, a goiter is much rarer, for the same reason: the thyroid doesn’t expand because it really doesn’t want to attract that much iodine. When you add selenium in a situation as just described, the thyroid will start looking for iodine much more aggressively. TSH will rise and you might even get a goiter (depending on how bad the iodine deficiency is). This might look like you’re getting more hypothyroid, but it isn’t: you’re just as hypothyroid (maybe even a little less if the thyroids strategies for finding iodine are successful), but you do have a higher TSH en maybe even a goiter. So, you could say that selenium can cause the TSH to rise and goiter to appear, but that is blaming the wrong guy: selenium is just protecting the thyroid from damage. Besides, there is no guy to blame: the cause is the iodine deficiency. Taking iodine raises my TSH! Am I getting (more) hypothyroid? No, your body is rebuilding NISes. If you’ve been iodine deficiency for a long time, your NISes will have mostly gone (what you don’t use, you lose). When you start adding in iodine, these will have to be rebuilt, the bodies sign to do this is raising the TSH. A doctor might conclude that giving a person iodine will make him (more) hypothyroid. But this is not the case: the body is jumping up and down with excitement and building NISes as fast as it possibly can. The raised TSH can be there for many months, indicating it takes quite a long time to rebuild the NISes. A healthy thyroid can only exist in a healthy body and your body can only function optimally with a healthy thyroid. When you have thyroid problems, don’t fixate on the thyroid gland but look at your overall health. Your body is not getting what it needs. Fix these deficiencies. Make sure your digestion works well. Fix any absorption problems you have. Fix any hormonal inbalances. Detox from toxins.